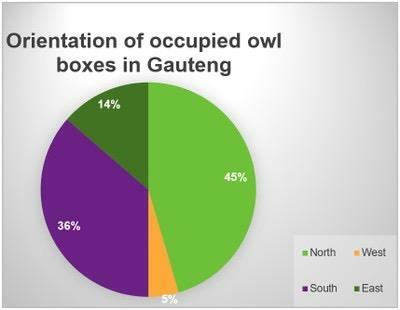 This proposal indicates the number of owl boxes the Parkhurst suburb can support. We have included a motivation relating to owl box carrying capacity as well as areas where we believe owl release programmes are well suited. This is a guideline only. We feel that Parkhurst can support 20 owl boxes. Not all of these owl boxes will enjoy annual occupancy, however, the positioning of these boxes will create a net of suitable sites from which owls can pick and choose. There may be years where previously occupied boxes go unused while previously unoccupied owl boxes enjoy success. 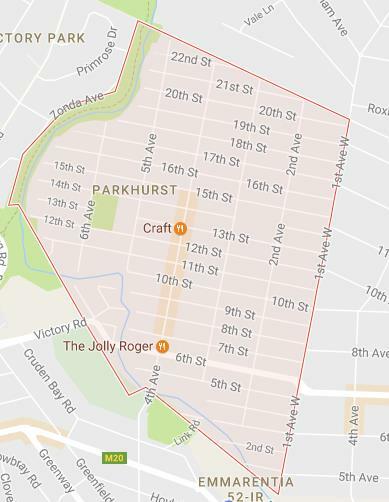 From google imagery we have identified 200 trees (Map 1) suitable for owl box installation within the suburb of Parkhurst. From these trees, we have mapped 20 “territories” with approximately 500 meters between each site (Map 2). Map 2 is interactive and by following the link and clicking on each individual icon, a viewer is able to access the motivation for the placement of that particular owl box. Once a resident has opted to install an owl box, the icon on Map 2, closest to that address will become red and only the next owl box location site will become available. For example; If a resident in 17th street, Parkhurst, elects to have an owl box installed in their garden, the next site will need to be as close to the proposed icon at the cnr 21st & 4th Ave, Parkhurst. Owl boxes closest to the recommended sites will lock off that icon. Hopefully that makes sense? The proposed 20 owl boxes in Parkhurst are what we believe to be optimum. If the community uptake is lower than this, that is fine. We do not recommend that uptake exceeds the 20 boxes suggested in this proposal. There are certain owl boxes which we feel are priority installations. These are the boxes close to the Braamfontein Spruit as well as school and clinic sites within Parkhurst. The priority boxes are indicated with a green icon on map 2. The key to the success of a programme of this nature is the service and maintenance of the owl boxes. 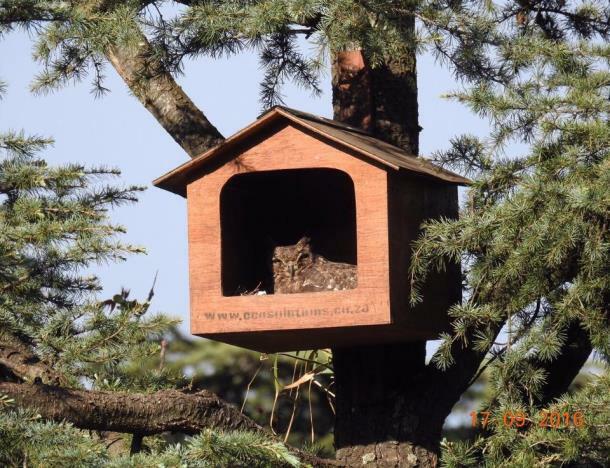 All participants in the Parkhurst owl project need to undertake to maintain and service the potential owl breeding site within their tree, even if the box is not enjoying occupancy. Additionally, the ringing of chicks, community involvement and school owl release programmes etc. all contribute to the success of a project of this nature. It is recommended that residents of Parkhurst are urged to contact EcoSolutions when experiencing high rodent infestations. We are able to assist with reducing rodent populations without the use of poison. Rodenticides may be counterproductive to your owl programme. 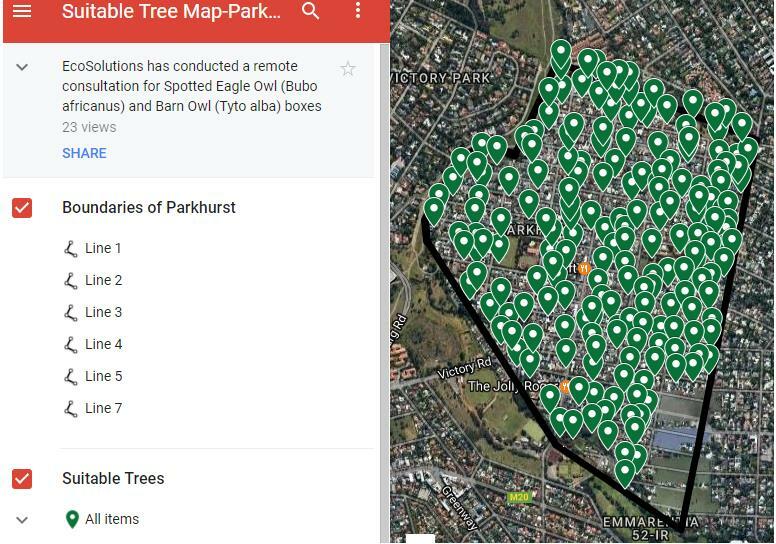 The following interactive map shows the number of suitable trees which could be used to install owl boxes in the Parkhurst area. 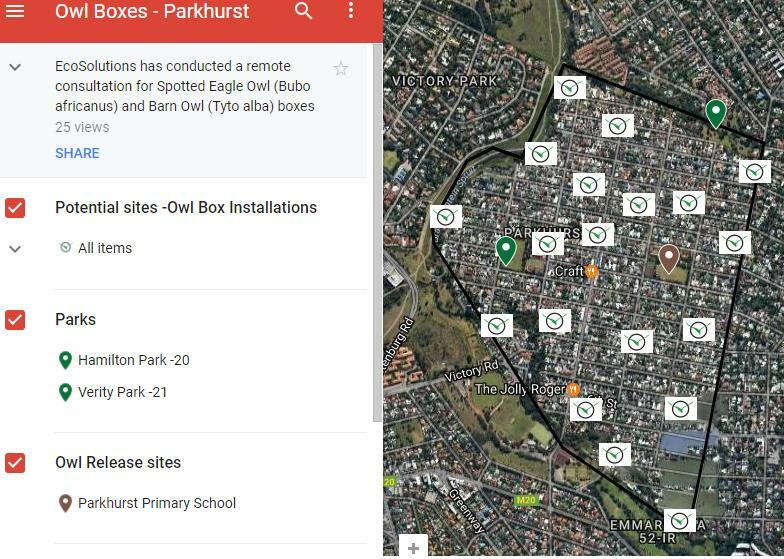 The following interactive map shows the number of owl boxes which could be installed in Parkhurst area. The main aim and importance of the Owl Box Project is to create safe and suitable breeding sites for both the Spotted Eagle Owl (Bubo africanus) and the Barn Owl (Tyto alba). Both these owl species are found in the greater Gauteng area and from the number of youngsters handed into ourselves, the zoo and rehabilitation centres (150+ p/a). It has been established that breeding sites are a limiting factor in the ability for these owl species to maintain populations relative to potential carrying capacities. The key to location is more about finding a place that is relatively undisturbed instead of a specific tree or site. Undisturbed is not necessarily a remote tree at the bottom of the garden – owls in urban areas are comfortable with cars, driveways, kids, dogs, and cats. Undisturbed really covers direct disturbance. A place where people cannot easily access the box and remove chicks or bang against the box which would cause the owls to leave the box during the day. Disturbing an owl in a breeding box during the day is problematic. The female will often not return to the box until nightfall and consequently, the chicks are left unprotected from crows, cats and other potential predators of small chicks and eggs. In addition, the owlets, and eggs, without the female to shield them can be exposed to long periods of sunlight or high winds and afternoon showers. If we must disturb an owl – for ringing purposes for instance – it is always undertaken at dusk as this allows the female to return to the box quickly once the ringing has been completed. boxes with the entrance of the box facing away from the house i.e. East or West. This may account for the lower occupancy percentage as indicated on the graph. As a consequence of this installation bias, it is almost impossible at this stage to categorically say that there is an orientation preference. Establishing an orientation preference is still an ongoing undertaking and we are adding data relating to orientation on completion of each owl box service. Probably one of the most frequently asked questions that we receive from prospective and excited clients regarding their new owl box is “How long before we have owls?” 15 years along and this is still a question that we are unable to answer. What we can tell you is based on the 150 plus EcoSolutions owl boxes that are serviced and occupied nationally. We have experienced owls occupying owl boxes within two weeks from the installation date however, this is far from the norm. The large majority of our occupied owl boxes have taken anything from 2 – 5 years before occupancy occurs. That is the reality of it, you could be waiting for 5 years for occupancy to occur; that is if you experience occupancy at all. The data that we have collected over the course of this project has allowed us to provide you with a blueprint which ensures that everything that can be done to create a viable owl breeding site, has been done. It must be stated that in order for us to collect and interpret data collected through this programme, the unoccupied boxes are just as important to our findings as the occupied ones. Occupancy trends can be established, areas with low occupancy can be identified and perhaps corrected. It is through the collation of information that this project produces the results that it does. At this stage, one thing that we can say is that our data clearly confirms that the potential occupancy of your owl box is directly related to its annual service and maintenance. The most important component in an owl box is not it’s design, it’s colour or even its location. It is the pea gravel substrate within the box. This substrate allows owls to form a ”cup” in which to lay their eggs and raise their young. 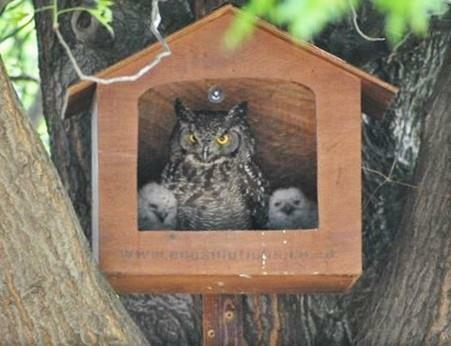 Without it, the box is not an owl box – it will not be used by owls and is really just a box high up in your tree. Why does my owl box need to be serviced annually and the substrate replaced? Owl boxes are designed to replicate a cavity in a tree. Although Johannesburg is well treed, the majority of the trees are alive and unlike dead trees, do not have natural cavities. As a result, your owl box will attract the attention and fill the requirements for many cavity breeding and roosting residents. It is fine for squirrels, Egyptian geese, Genets and other birds to use it out of season. However, these usurpers bring sticks, paper, litter and all sorts of things into the box. Unless these are removed, owls will not utilise your owl box to breed in. Twice a year, prior to the owl breeding season, EcoSolutions undertakes to clean out the box and replace the substrate necessary for owl occupation. In addition, a bi-annual service fee of R1280,00 allows us to check that the box is still firmly attached, provide it with a new coat of varnish and make sure that the bee proofing is still intact. Additionally, the service component allows us to seamlessly introduce improved designs, greater expertise and understanding into our programme. If our data reveals that a specific orientation is optimum for successful occupancy, we will implement this during your annual service. EcoSolutions is actively involved in several educational programmes. 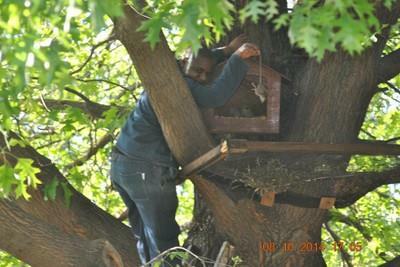 We conduct owl releases through Schools, Food Gardens and Eco-Estates around Gauteng. These areas allow us to create reasonably large poison free zones which lend themselves to owl habitation. We currently have roughly 60 schools and 15 estates involved in the owl release programme. Since the inception of this programme over 88 000 children have been involved. Owls are both fascinating and beautiful creatures. Their presence on your property offers hours of intriguing viewing and entertainment, furthermore they provide an efficient and environmentally friendly means of pest control. Participation in the owl release programme has captured the imagination of both adults and children alike. Feeding teams and rosters, release day countdowns and post release observations have all left participants feeling a sense of accomplishment and a greater appreciation for the avian fauna that occurs within their surroundings. It is always recommended that signage be placed below installed owl boxes in green areas such as parks and public spaces. The cost of signage is R370,00 per a sign. This allows residents and members of the public insight into the environmentally responsible manner in which the members of The Owl Box Project are controlling their rodent and insect populations. It also enhances a green ethos and in some cases, has resulted in the more dedicated and frequent use of waste bins. It tends to create a green and environmentally friendly consciousness which impacts on both residents and visitors alike. 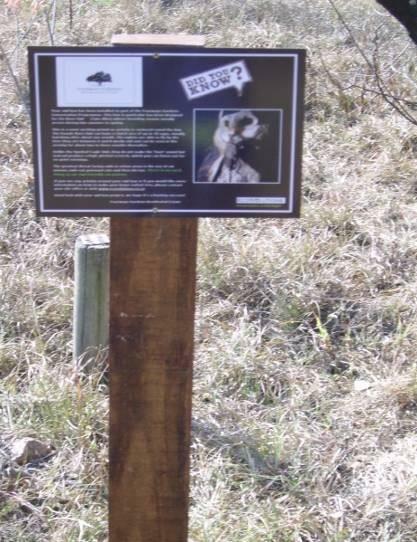 The signs provide a contact number where members of the public can report sightings and observations. In previous suburb installation sites, it has produced a greater understanding of rodents and rodent related issues.